Was President Barack Obama's appearance on the low-budget talk-show spoof Between Two Ferns, hosted by Zach Galifianakis, a clever move to appeal to Millennials on their own terms or a ham-fisted blow to the prestige of the presidency? Reports indicate the Funny or Die clip sent at least 32,000 visits to the Healthcare.gov website since its debut Tuesday morning. Predictably, it drove a wedge between those who found it to be a humorous, bold move by the leader of the free world against others, including Fox News talk-show host Bill O’Reilly, who recoiled at the idea of a sitting president taking this approach. There may not have been an Internet when Abraham Lincoln, or even Ronald Reagan, was in office, but that didn’t stop him from drawing the comparison. The debate didn’t end there. Here is a sampling of reaction on Twitter, where it ranged from the ancillary to the horrified. Unimaginable that Truman, Ike, JFK, Reagan would appear on Between Two Ferns. They carefully protected majesty of their office. Yes, because the Internet wasn't a thing RT @David_Gergen: Unimaginable that Truman, Ike, JFK, Reagan would appear on Between Two Ferns. Obama's 'Between Two Ferns' video has 11 million views. Drove nearly 40% increase in http://t.co/C6g9lAbsrN traffic. Smart marketing! The fact that it took Between Two Ferns to get people to sign up for Obamacare is awesome and horrible at the same time. 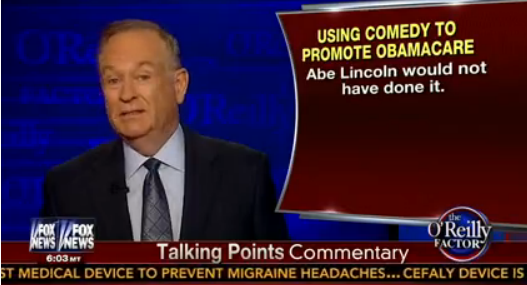 Re: O'Reilly's "Lincoln wouldn't have done it"? He told so many jokes--some off-color--that press critics assailed his lack of dignity.